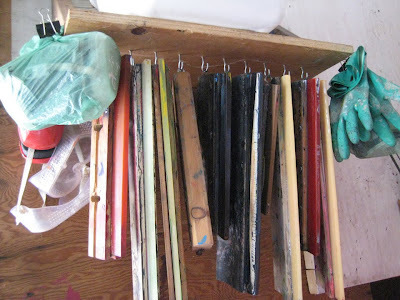 If you love screenprinting, you probably have several squeegees. Different sizes and with a variety of blade hardness, such as rubber or polyurethane. If you use them often, make sure they are easy to access. Store them away from heat & sunlight as the blades may warp or harden over time. this can cause the blade to loose it's shape, bend or indent. even under table or bench. Cheapest solution, suits most squeegee sizes. this may be good for holding inky squeegees between prints? Sloping slats on inside of side of frame, squeegees slot in. This could be either on the wall, under bench or free-standing. Fairly easy to make yourself, but this only fits one size squeegee. 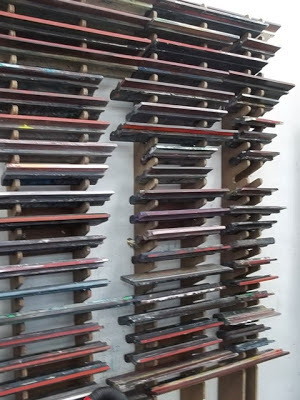 Wooden frame with pegs, fits all squeegee sizes. 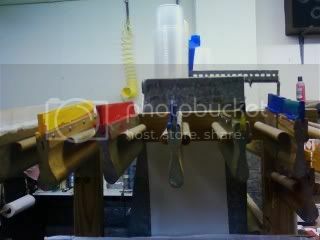 or flat on table or shelf with squeegees upright. A solid back board with support slats slotted in. Can be wall-mounted or with base to make free-standing. Make it to suit any number of squeegees and any length. 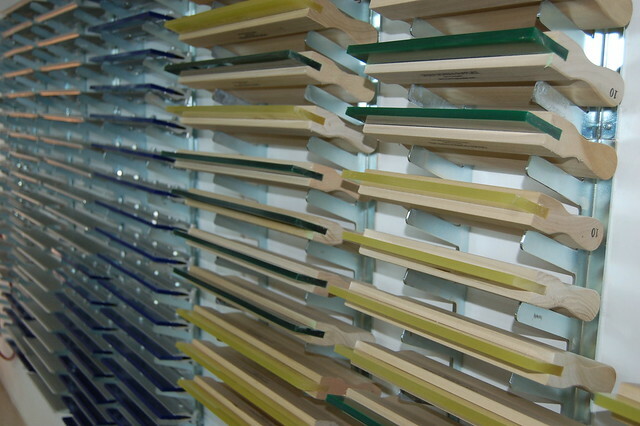 Wall-mounted rack at AUT, marine plywood. Small metal bracket screwed to wall, tidy. Great solution if you have friends in metal fabrication industry! Do you have any other tips or advice about storing squeegees? 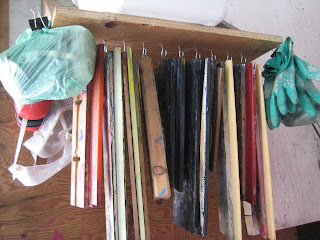 Or got another squeegee storage idea to share with other printmakers? Post a comment below and let us know about it!